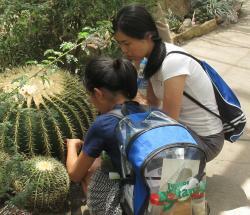 Visit the U.S. Botanic Garden and check out a Junior Botanist Adventure Kit. You must be nine or older and be accompanied by an adult with an official ID (such as a driver's license). Your adventures will begin in the Garden Court and continue throughout our Conservatory. Each room may take approximately 30 minutes to complete. It often takes multiple visits to the Garden to complete all the adventure sheets. (Schools reserving Junior Botanist on Fridays may complete the adventure sheets in one visit by assigning small groups to different rooms). With your completed adventure sheets, return to our Visitor Information desk and you will receive your Apprentice Junior Botanist badge. You will then continue your botanic adventures at home. Once all adventure sheets are completed, you will submit them to our botanist for review. If successfully completed, you will become an official U.S. Botanic Garden Junior Botanist and our botanist will send you a Junior Botanist certificate and tools to continue your study of botany. You will also be invited to attend a behind the scene tour of our greenhouses. Who are these strange green life forms among us? Since they make our lives possible it's a good idea to get to know them! You can have an adventure at the U.S. Botanic Garden Conservatory on your way to becoming a Junior Botanist!